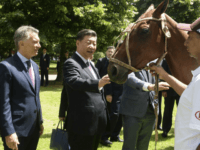 Argentine President Mauricio Macri and Chinese Communist Party leader spent much of Sunday, the day after the G-20 summit in Buenos Aires together, signing billion-dollar trade deals and exchanging gifts. 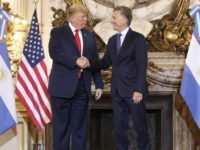 President Donald Trump and Argentinian leader Mauricio Macri held a “positive” meeting at the Friday to discuss solutions to the ongoing political and humanitarian crisis in Venezuela under the Maduro regime. 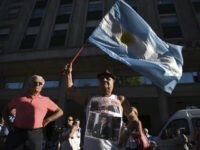 The president of Argentina, Mauricio Macri, requested before the U.N. General Assembly on Tuesday that his peers not harbor Iranian terrorists implicated in the 1994 bombing of the Argentine-Israeli Mutual Association (AMIA), the deadliest terrorist attack in the Western Hemisphere before September 11, 2001. 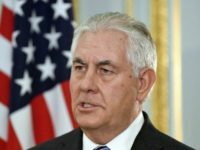 Secretary of State Rex Tillerson has left for a week-long tour of Latin America, where he will seek to promote the Trump administration’s foreign policy agenda and shore up U.S. alliances in the region. 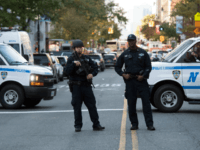 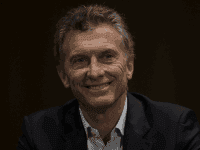 President of Argentina Mauricio Macri told reporters Wednesday that “there is no room for any gray” in the fight against terrorism, responding to the deaths of five Argentines in an act of jihad in New York City on Tuesday. 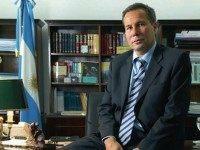 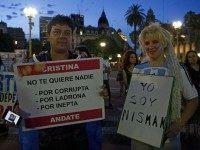 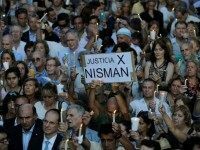 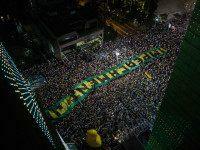 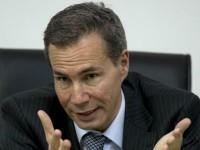 Thousands gathered in Buenos Aires, Argentina, Wednesday to commemorate the second anniversary of the killing of Alberto Nisman, a high-level prosecutor who was found lying in a pool of his own blood the night before he was to accuse former president Cristina Fernández de Kirchner of aiding Iranian terrorists. 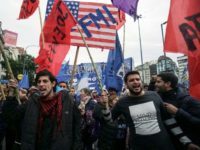 As many observers have noted, the election of Donald Trump to the U.S. presidency is the latest in a series of seismic global political shifts. 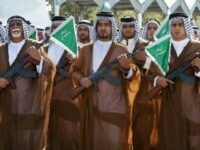 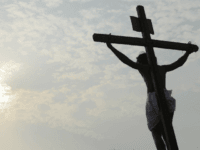 Many of those have occurred oceans away, from Western Europe to the Middle East to Asia. 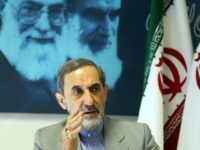 An Argentine judge officially requested that Singapore or Malaysia extradite Ali Akbar Velayati, a senior adviser to Iranian Supreme Leader Ali Khamenei and a former foreign minister, for his role in orchestrating a 1994 attack on an Israeli organization. 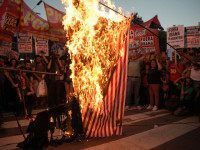 A small collection of leftists organized a grand display in protest of President Obama’s trip to Argentina in Buenos Aires Wednesday, holding up banners reading “Go Home Obama” and burning the American flag. 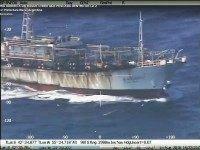 The Coast Guard of Argentina sunk a Chinese fishing ship trespassing into Argentine waters on Tuesday, after the trawler responded to calls to return to international waters by trying to ram into a Coast Guard vessel, according to the South American government. 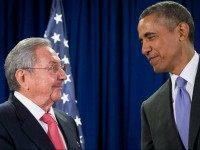 President Barack Obama confirmed on Twitter Thursday morning that he will visit the rogue communist dictatorship of Cuba in March, more than a year after implementing a series of concessions to the Raúl Castro regime that has enabled it to further oppress political dissent and create a refugee crisis in the Western Hemisphere. 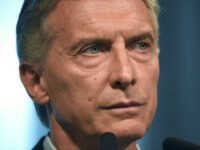 Argentine President Mauricio Macri has electrified a Mercosur trade bloc summit with the demand that Venezuela release its dozens of political prisoners or face sanctions from the group. 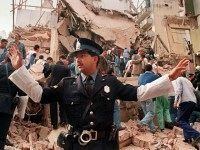 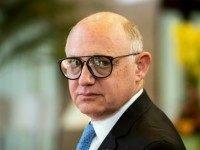 Newly released wiretap audio finds former Foreign Minister of Argentina Héctor Timerman admitting that the government of Iran “planted the bomb” at the Argentine-Israeli Mutual Association (AMIA) headquarters in 1994, the deadliest terror attack in Argentina’s history. 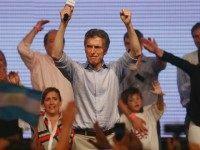 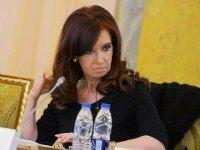 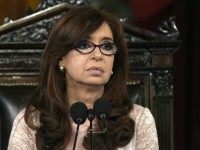 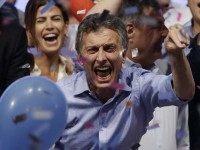 With right-wing Argentine President-elect Mauricio Macri set to assume his position as head of state on Thursday, outgoing President Cristina Fernández de Kirchner has become a major stress point in the transition, issuing multiple decrees, spending government money, and arguing over the details of the inauguration ceremony. 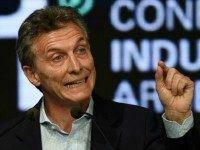 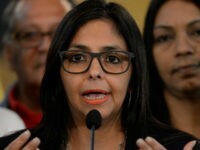 The Venezuelan government has accused Argentine President-Elect Mauricio Macri of “taking orders from the United States” following the conservative head of state to-be’s proposal to sanction Venezuela economically over human rights abuses against political dissidents.